Real Canadian maple syrup was an important Ojibwa food. Tending the kettles of maple syrup. To be a real Canadian, maple syrup should not only be part of your diet but you should probably make it yourself! 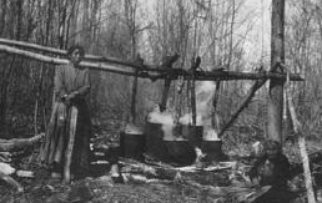 Used to flavor soups and stews, brushed on meat cooked over an open flame, made into candy and maple sugar, the processed sap from maple trees was a staple of the Ojibwa diet long before it was commercialized by European business men. During the Moon of Boiling, Izhkigamisegi Geezis, entire famlies would pack up and head to their particular section of the bush where maples (and birch trees) grew in abundance. 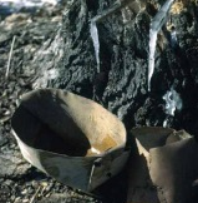 It was the time of year when the sap would begin to rise up from the roots that a whole year's supply of maple syrup and sugar would be processed and stored in birchbark baskets and containers known as makuks. A nadoban used to collect syrup. A single family could tap four or five hundred trees...not old trees by the way...young ones that had good shoots coming out. Sometimes two or three families worked a large section of bush and that meant that thousands of birchbark baskets called nadoban hung from each tree. That was why a good sugar bush also needed a healthy stand of birch trees close by. The old men harvested birch bark and the old women settled down to make a few new baskets to replace the old or damaged containers. In the meantime younger legs were to and fro-ing with the sap filled baskets. In the old days sap from the nadobans was strained into a much larger basket called an aasigidubaan through a sieve of cedar branches tied over top. But by the end of the nineteenth century most families had at least one big iron kettle that had been traded for furs. If there were any bits of leaves or twigs that managed to get into the big kettle they'd tend to settle on the bottom after the first boil. When the sap was settled it would be poured into a second kettle, boiled down again, strained again and that went on and on until the sap was pure. If the fire was too hot the kettle would boil over...but here's a bit of ancient Ojibwa wisdom to handle a situation like that. Just take a green stick, peel it and lay it across the kettle. It will stop boiling over. Works for other hot liquids, too. Another method is to take a balsam branch and give the kettle a fast whack right across the top. A third method was to take a chunk of deer or moose tallow and swipe it around the inside edge of the kettle. Clever bunch, those Indians, weren't they? Originators of the one and only real Canadian maple syrup!